Filipino riders get another chance to earn valuable points in the hope of qualifying for the Tokyo Olympics with the holding of the PRUride PH 2019 road race in Subic from May 24 to 26. Atty. 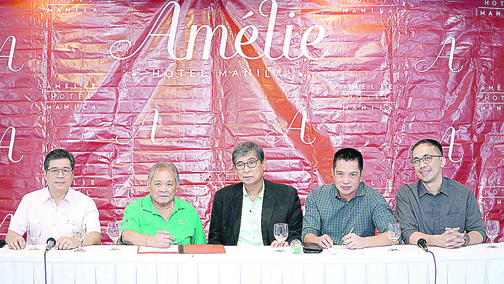 Roberto Uy, president of RUYGROUP Hotel Corp., and PSA president Dodo Catacutan sign the Memorandum of Agreement making Hotel Amelie Manila the new home of the weekly PSA Forum. Witnessing the signing are Amelie Hotel operations manager William Castro, Patafa president Popoy Juico and PSA vice-president Aldrin Cardona. The three-day event is the first professional race to be staged by British life insurer Pru Life UK. It is a UCI 2.2 accredited stage race. Several international teams are expected to join the meet and give local squads a run for their money, according to Pru Life UK Senior Vice President and Chief Customer Marketing Officer Allan Tumbaga. He mentioned that continental teams from countries like Hong Kong Canada, Australia, Indonesia, Sweden South Africa, Brunei, Korea, Vietnam, and Uzbekistan are among those which are coming over. “We expect something like 13-14 international teams to compete. So we’re quite excited about it,” said Tumbaga during the Philippine Sportswriters Association Forum Tuesday at its new home – the Amelie Hotel Manila. “We’ll be exposed internationally. We are very confident that we are pushing ourselves to the limit, not only for the sake of staging it, but for our athletes so they can participate and compete, for them to have a better feel of how to compete internationally, and of course, to gain points. Top local teams such as Go For Gold and 711 all expressed that they are up to the challenge. Rodriguez, the 711 team manager, said that other than earning Olympic points, the event would also help Filipino riders to warm up for the Southeast Asian Games here. Go For Gold riders Ismael Grospe, Ronnel and Edz Hualda joined 711’s Marcelo Felipe, Philippine Navy’s Ronald Oranza, and PRUride Philippine Ambassadors Gretchen Ho and Zoren Legaspi during the same session.